Opinion Miles Club Reviews - Legit or Scam? Opinion Miles Club Reviews – Legit or Scam? The Opinion Miles Club, available online at OpinionMilesClub.com, is a new market research company that works with United Airlines and their partners to provide people with an opportunity to earn free reward miles. Market research is an important tool for all companies, and the airline industry is certainly one of the most competitive industries in which providers could genuinely benefit from having access to direct consumer feedback and opinions. 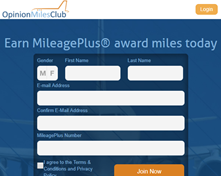 Opinion Miles Club says that members can join for free just by providing them with their MileagePlus card member number, and they will provide you with 300 award miles just for signing up and completing your first survey. Opinion Miles Club appears to work like most other online paid survey companies. After members sign up and complete their profile, they will be provided with different surveys to complete whenever they are available and member is determined to be a possible match for the information they are looking for. Their website says that by partnering with them, members will also receive email invitations to different opportunities by United Airlines and their partner companies, whenever members qualify. Whenever you successfully complete a survey, you will be awarded by having the miles directly deposited into your MileagePlus account. In addition, their website says that takin surveys on a regular basis keeps your MileagePlus account active, so your miles won’t expire. It seems that a quick search for reviews of the Opinion Miles Club shows a lot of vocally unhappy people. These negative reviews appear to be fueled by a variety of different issues. The first is that in order to qualify for the survey rewards, members must meet a very long list of very specific criteria. This means that members can spend quite a bit of time filling out questions only to be told abruptly that they do not qualify for the survey and they will not receive any rewards. To make matters worse, many of the customers said that these “qualifying questions” asked for significant amounts of personal data, including their sexual orientation and yearly income, as well as questions about their travel preferences before they were kicked out of the survey. This has led to some members suspecting that they are actually providing worthwhile information that they simply aren’t being paid for. Finally, there is also a group of members who has complained that they were able to earn a significant number of miles working with this company, only to be told later that they had done something that caused all their miles to be cancelled or invalidated. These members claim that after repeated phone calls and emails they still were not given a valid reason for why their miles were taken away. Still, some members of this company claim that they have successfully collected rewards from Opinion Miles Club. Prospective customers may decide that it is worth the risk to work with them, but that will have to be a personal decision. Opinion Miles Club Reviews ? Average Rating for " Opinion Miles Club Reviews " is 2.33 out of 5 based on 3 reviews. Opinion Miles Club is an easy way to earn from 50 to 100 United Mileage Plus miles in just 10 minutes or so. I took two surveys yrsterday and earned 110 miles. The miles are treated exactly the same as any other United Mileage Plus miles in your account and that includes expiration date. It's not a scam and I love it. I've racked up a lot of miles with this program. However, I've spent many hours doing so. Lately upon COMPLETiNG entire survey, screen pops up "You do not qualify ". Watch out for JD Power surveys. I've been screwed more than once by them. I'm very pissed off this am. I have contacted OM requesting the miles be deposited into my account considering I completed survey in its entirety. I can not recommend this program. It was good in the beginning but no longer. I'm done after today. I don't work for free. Beware! I used to do a lot of surveys and racked up about 10K miles. Recently I've had problems with my account and have been getting booted out or after having completed several questions go the old, "this survey is not for you." Well I've just about had it with this program. The opinion miles survey is no longer for me."